Total Recorder Developer Edition, Total Recorder - captures any audio from the Internet, records audio from CD, microphone, line-in, converts any sound formats to WAVE file. Phone recording system. Integrate audio recording, editing, processing, and playing features with other applications. 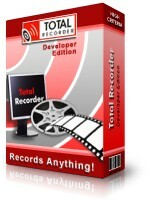 Total Recorder Developer Edition is an edition of Total Recorder that allows you to integrate the capabilities of Total Recorder (audio and video recording, editing, processing, and playing) with other applications. With the Developer Edition, you can record from any combination of video and audio sources, including output of another audio application in Software mode. Note that the Total Recorder Developer Edition License Agreement does not allow for the reselling or redistribution of the Total Recorder Developer Edition software in any way, shape, or form. Please contact High Criteria if you have any questions about the License Agreement or your rights as a purchaser. As a stand-alone program, it has the same features as the VideoPro Edition. You can obtain the source code for the symbolic language (similar to Visual Basic) that corresponds to the interface operations you performed during your current Total Recorder session. The code can be appended with other useful information you can use to write applications to control Total Recorder. This feature can greatly facilitate writing your own code to control Total Recorder Developer Edition through COM technology. These are only some of the features of Total Recorder Developer Edition. For more information, refer to the program's Help or the PDF-documentation. Download and install a no-cost evaluation copy of the program to make sure it addresses your requirements and runs properly on your PC. Try the product. We have prepared a FAQ-page and a number of tutorials to help you achieve your goals faster. Free and fast technical support is provided even with the no-cost evaluation version of our products. You must purchase a registration from us. Please refer to the purchase page on our web site for the various payment options. We will send you an email with a registration code. You plug the registration code into the evaluation version and you will then have a fully functioning version of the program. You can download tr86de.exe and run it to install the no-cost evaluation version of Total Recorder Developer Edition. The evaluation copy is a fully functional version of the program with the exception that an audible noise will be inserted about every 60 seconds throughout each recording you make, a mark is added to captured images when recording video, and no more than three files can be processed in batch. For unlimited use of Total Recorder, you must purchase a Total Recorder license. Total Recorder Developer Edition Version 8.6 is available free of charge to purchasers of previous versions of the Developer Edition. To update your version of Total Recorder, please download the latest version of Total Recorder and install it on the top of the existing install. If you install Total Recorder version 8.6 over version 6.x, 7.x or 8.x, all of the Total Recorder settings and registration information are preserved. For a limited time only, licensed users of Total Recorder VideoPro Edition can upgrade to the Developer Edition for an upgrade fee of $46.00 US. Registered users of the VideoPro Edition should use this link to purchase the Developer Edition at this price. When you upgrade, the installation of the Developer Edition will remove the VideoPro Edition from your PC. If you evaluate the Developer Edition and decide not to purchase it, you must re-install the VideoPro Edition and specify your VideoPro Edition registration key. Your registration key for VideoPro Edition cannot be used for the Developer Edition. Free and fast technical support is provided even with the no-cost evaluation version of our products. If you encounter a problem that is not listed in either the Total Recorder Help (Troubleshooting section) or in the FAQ, e-mail us at support@highcriteria.com. If you have any suggestions regarding our programs, please do not hesitate to contact us. 32-bit or 64-bit version of Microsoft Windows XP (SP2 or later), Windows Vista, Windows 7, Windows 8, Windows 8.1 or Windows 10. If you want to use Total Recorder with an older operating system, please follow this link. DirectX version 9.0 or later (you can download the latest version of Direct X from the Microsoft website). A graphic card that meets the VMR System Requirements. All video cards with the exception of some older cards meet these requirements. Specific requirements for hardware resources depend on the operations you plan to perform with video.